It is encouraging to note the growing interest in Marian Price even if it has been slow to materialise. 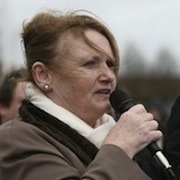 She was recently transferred to Hydebank prison hospital due to concerns over her health. Eight months of solitary incarceration has led to deterioration in her mental and physical condition, so much so, that her family and friends were becoming increasingly worried for her wellbeing. It is a question of conjecture whether this move will benefit her or not. What we can be certain of is that Marian will continue to suffer whilst she remains imprisoned. The burden of her predicament weighs heavily on her shoulders every minute of every day. The separation from her family is particularly painful for a woman of her age: As we grow older time becomes more precious. This whole experience has deprived her of so much in terms of her fundamental entitlements as a human being. Freedom empowers us to enjoy the fullness of life which is why the loss of liberty is so debilitating. Only those who have spent time in prison can fully grasp the enormity of this. Marian Price has had her freedom removed by the unjust decision of a British government minister without so much as an explanation. Her right to due process her been set aside on a spurious pretext. A crucial document that could secure her release has been lost or destroyed according to Owen Patterson. Where else would you get it? So where does this leave her? At the mercy of a government that views her as a present threat to the state because of her political beliefs. And herein is the real reason for revoking her licence. Never mind the bullshitting of the politicians. Marian Price is a political hostage, plain and simple. She is an example of what those who dissent from British rule can expect for their sins. The cost of being a principled, articulate republican has always been high and, in the case of Marian Price, she has paid well over the odds. Left alone the British government will continue to hold Marian for as long as is possible. Without real political pressure being brought to bear Owen Patterson will not be in any hurry to release her. What is required here is a vociferous public campaign and lobbying strategy to win this woman’s freedom. We did it for Brendan Lillis last year in respect of his licence, let us do the same for Marian now. We have it in our power to get this proud Irishwoman out of jail and back to her family. Show your support for Marian Price. Join the campaign for her immediate release. Stand against this injustice and help bring her home. On the 8th of March at 7.30pm there will be a public meeting to discuss the ongoing incarceration of Marian Price. The meeting will take place in the Conway Education Centre, Conway Mill 5/7, Conway Street, Falls Road, Belfast. This meeting will give the public the opportunity to hear the facts of the case, a case that has attracted international interest. The event is organised by local human rights activists and is not affiliated to any political grouping. Panel members will include Marian Price’s legal representative, world renowned human rights activist and former Armagh Gaol Chaplain Monsignor Raymond Murray and civil and human rights activist Bernadette McAliskey.